SCAD FASH celebrates fashion as a universal language, garments as important conduits of identity, and film as an immersive and memorable medium. 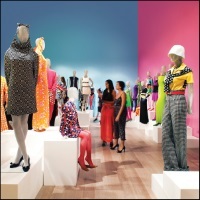 Situated within the SCAD Atlanta campus at 1600 Peachtree St., SCAD FASH focuses on the future of fashion design, connecting conceptual to historical principles of dress — whether ceremonial, celebratory or casual — and welcomes visitors of all ages to engage with dynamic exhibitions, captivating films and educationally enriching events. Parking: Parking is available in designated spaces of the fourth floor parking garage. Alternate arrangements can be made in advance for oversized facilities and large tour groups.